A favorite go-to for the most of us, I’m sure. 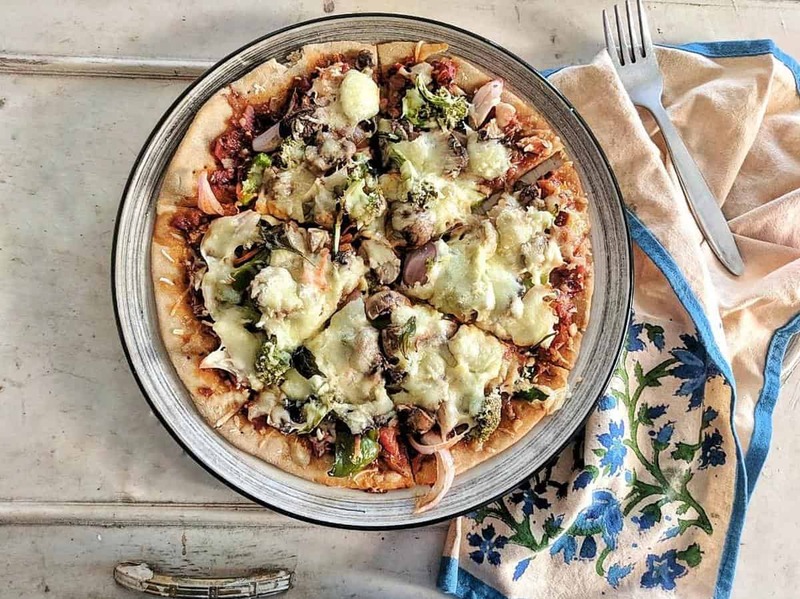 That thin crust -soft in the center and crisp at the edges, that inviting aroma of a good tomato sauce base and choicest toppings, all tied together with oodles of cheese. Oh, if only it could be slightly guilt-free! But it is now, when you make your own wholewheat crust pizza, at home, on the convection mode in microwave even! Sound too good to be true? Try my whole-wheat pizza recipe to believe it! 2+ years into my fitness and nutrition journey, I find myself at a place where I look for healthier, wholesome alternatives yet I prefer the old-school methods, where everything was done from a scratch, the time it took was relished and more wholesome ingredients were put in play. I do not necessarily approve of readymade pizza bases, mixes and sauces any longer (although once upon a time they were great finds) because anything made at home from a scratch gives you a better chance to control the final taste and texture, and the immense satisfaction it begets is another thing altogether. Also, I believe that nutrition in its most real sense had more to do with using fresh ingredients and less and less of processed ones, instead of harrowing over smallest amounts of calories. It took me a while to arrive at this lesson, but here I am now and enjoying it to the hilt! Healthy Wholewheat Pizza – rolled base. This pizza base is made from whole wheat flour dough, is eggless, uses hardly any oil and boasts of fresh ingredients. The usage of wholewheat flour variety ensures fewer empty calories in contrast to the case of refined flour, as well as more fiber and hence greater satiety quotient. The topping can be as versatile as it gets – use salami/ chicken chunks/ fish/ sausage to add more protein, although there’s considerable amount of cheese there to fulfill both protein and fat macros. You can choose from a broad range of cheese options, although combining them with mozzarella gives best results, for obvious reasons. Since these are thin-crust and I was feeding 3 people that day (including self), I made two 8-inch pizzas with different toppings – mushrooms, spinach, corn, onions and bell peppers for one; mushrooms, sun-dried tomatoes, olives and olive oil for another. 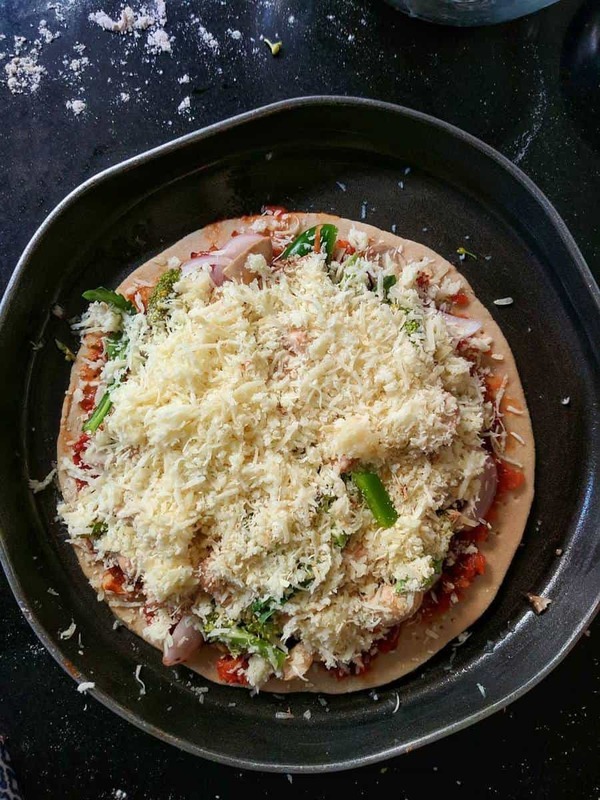 I used grated cheddar cheese along with loads of mozzarella – for me it’s just not worth the toil if pizza doesn’t have enough cheese. You could put your own unique spin on your pizza – the possibilities are endless! If you’re looking for healthy alternatives for snacks or baking, do try your hand at my Wholewheat Oats Herb Crackers, Healthy Buckwheat Protein Pancakes or Chocolate Banana Muffins with Millet Flour Mix too! Activate the yeast by adding it to lukewarm water along with sugar. Stir slightly until the sugar has dissolved and set aside for 5-10 minutes. Foam should start appearing on the surface and the yeast should completely dissolve. In a bowl, add the yeast water, oil, salt to the flour and mix well. Dust some flour on a surface and knead the dough on it with light hands at first, slowly progressing to firm kneading. You should have a soft, smooth and elastic dough by the end. To test the elasticity, poke the dough lightly – if it bounces back, you can stop kneading. Set the dough aside for rising. Cover with a plate or cling-sheet. For the sauce, heat oil in a saucepan and add minced garlic and chopped onions. Stir until the raw smell of onions disappears. Add tomatoes, tomato puree, dried herbs, sugar and salt. Cook on a low flame until the juices have rendered. Set aside to cool. Back to the dough now – depending upon the humidity and climate conditions, your dough will rise to at least twice the size within 20 minutes to 2 hours. Colder climates require more time. Since I live in a coastal city, my dough had risen in about 20-30 minutes. Divide the dough into 2 roughly equal portions. If you do not intend to make 2 pizzas on the same day, wrap one portion in a cling sheet and refrigerate the same to use later. See Notes. Preheat your oven to the highest temperature it allows, preferably above 200°C for 10-15 minutes. Ensure that it is evenly heated for best results. Grease the baking pan with oil and dust some flour or cornmeal on the same. 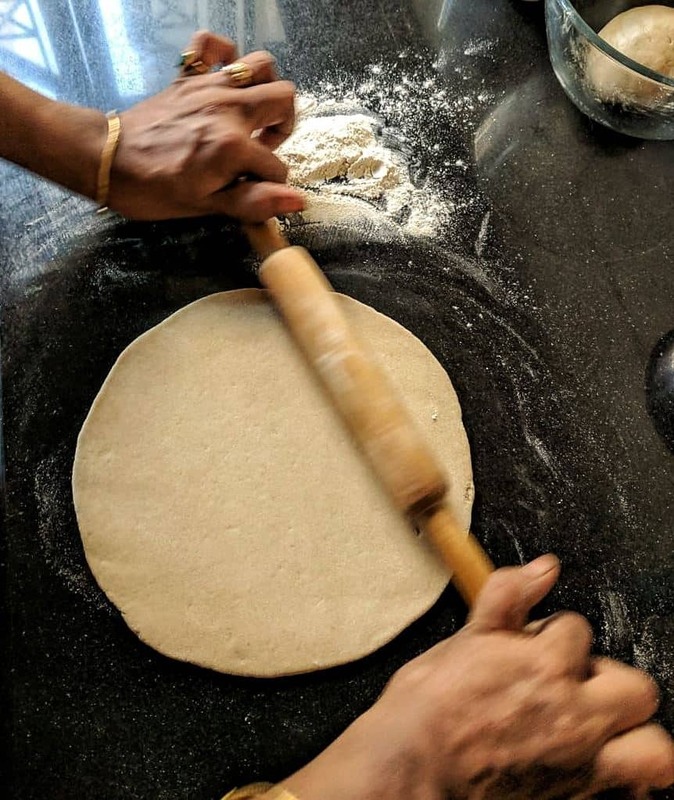 Roll each portion using a belan or rolling pin into a uniform, even sheet, preferably circular in shape. You could also choose to flatten the dough directly into flour-dusted baking sheet, as per your preference. Stop rolling/ flattening once it is 1/8” or ½ centimeter thick. Transfer gently onto the baking sheet. 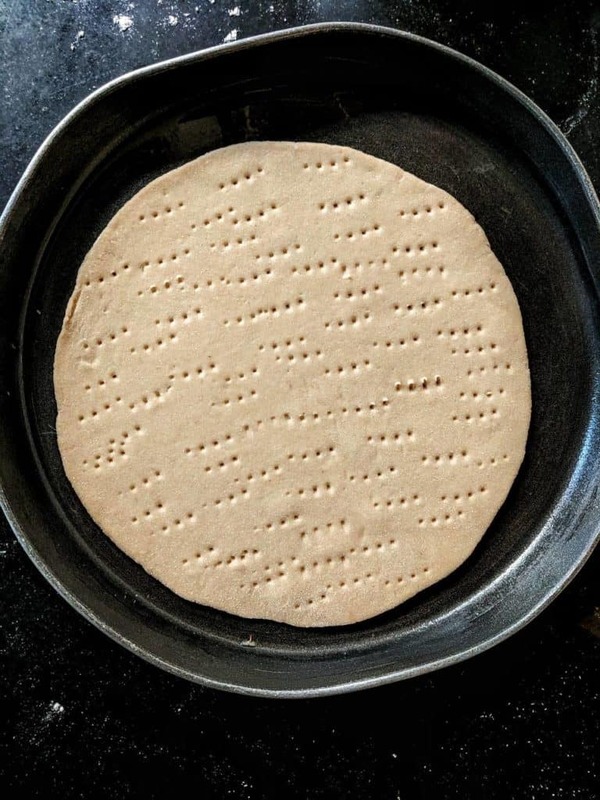 Pierce holes with a fork to ensure even cooking and crisp crust. Spread the tomato sauce evenly on the dough. Add toppings, leaving about a centimeter from the edge. Sprinkle some salt and seasoning. Cover with generous amounts of cheese. Transfer to the pre-heated oven and bake at 200°C for 20-30 minutes. The exact baking time depends upon the temperature chosen and oven settings. Check for the crispness of the crust after 20 minutes and bake further accordingly. I like my crust to be slightly toastier, and hence I bake mine for about 40 minutes. Slice using a pizza cutter while hot and serve immediately. For storing the kneaded dough, brush/ spray oil on it and wrap in a cling-sheet. Store in a Ziploc bag and freeze for up to 3 months. Thaw at room temperature before usage. If using a microwave oven, you will probably need to bake one pizza after another. Roll the kneaded dough right before transferring to the oven, else it will dry. Do not use too many toppings/ toppings with high water content else the baking time would vary and they may even interfere with the crispiness of the crust. If your baking tray is too big/ you rolled out your dough into a big sheet, do not worry. Fold the rolled sheet into quarters, transfer with the help of a spatula and gently unfold the sheet inside the baking pan. That pizza is so healthy and yummy!! So many options for toppings! Bookmarking this for the weekend! Wow.. sounds so delicious healthy & easy too.. though I am very scared to make any kind of breads at home. Will give this a try..